(1916-05-13)May 13, 1916, near Columbia, Tennessee, U.S.
Jack Anglin (May 13, 1916 – March 8, 1963) was an American country music singer best known as a member of the Anglin Brothers, and later Johnnie & Jack with Johnnie Wright. Anglin was born on a farm near Columbia, Tennessee. He worked at a local hosiery mill and became acquainted with his future wife, Louise; and through her, her brother, Johnnie Wright. At the time Wright, his wife Murial (Kitty Wells) and Louise were regulars on WSIX-AM as Johnnie Wright And The Harmony Girls. 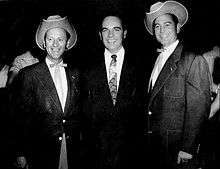 When the Anglin Brothers disbanded in 1939, Anglin joined Johnnie Wright as Johnnie Wright and the Happy Roving Cowboys with Jack Anglin. In 1940, they became Johnnie & Jack, who enjoyed success as a vocal duo until Anglin's death in 1963. The duo became members of the Grand Ole Opry in the 1940s. Anglin married Louise Wright in 1933; they were 17 and 16 years old respectively. Their 30-year marriage ended with Jack's death on March 8, 1963. The couple had a son, Terry. Driving alone to attend a memorial service for Patsy Cline not far from his home, he rounded a bend in Madison, Tennessee at a high speed and died in the ensuing crash on March 8, 1963. ↑ "Opry Timeline - 1940s". Retrieved August 27, 2013. Gordon Polatnick. "Fuller Up Dead Musician Directory". Archived from the original on 2009-10-24. Retrieved August 27, 2013. Wikimedia Commons has media related to Jack Anglin.